Fun Free Kindle eBooks for Christmas! Every Christmas, I really enjoy reading some fun and special Christmas ebooks on my Kindle each year. Amazon’s Kindle Store is full of surprises every year, and it’s really delightful when you discover a new ebook about Christmas. (Especially when it’s by an author that you already know!) It turns out that some of the greatest authors in history have written Christmas stories — and they’re all available for free in Amazon’s Kindle store! I’ve enjoyed the way Charles Dickens writes, with simple yet very moving stories — and I’m not the only one. On Amazon’s list of the best-selling free ebooks, A Christmas Carol is currently #11. And interestingly, it turns out that Charles Dickens followed this up with even more Christmas stories — including The Cricket on the Hearth, The Chimes, and The Haunted Man and the Ghost’s Bargain. All there stories are available for free in Amazon’s Kindle store. And the stories had an even greater impact. 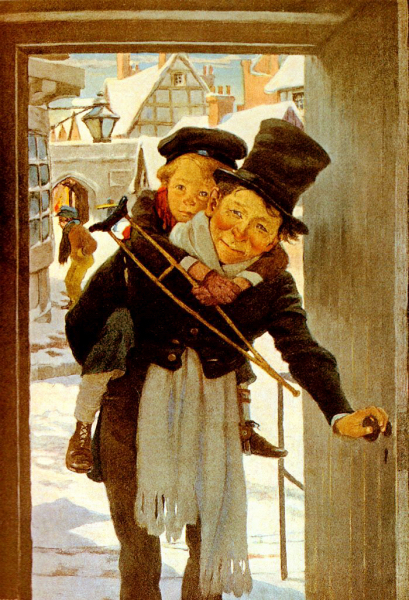 Irving also researched holiday traditions as far back as 1652, and according to Wikipedia, and his popular stories “contributed to the revival and reinterpretation of the Christmas holiday in the United States.” Even Charles Dickens himself said that Irving’s stories influenced his own famous novella, A Christmas Carol. There’s some interesting trivia about this story. In its first printing in 1823, Santa’s reindeer were named “Dunder” and “Blixem,” which are the Dutch words for “thunder” and “lightning.” But over the years their names changed into the more familiar-sounding “Donner” and “Blitzen”! He’s one of the most famous poets of the 19th century — and he in 1850 wrote a stark but thoughtful poem about visiting St. Peter’s church in Rome. It ultimately turns into a discussion about the nature of faith, but it was the first poem he published after his marriage, according to Wikipedia, and gives rare hints about the famous poet’s own religious views. One reviewer on Amazon described it as “A strange flighty trek in and out of trances and chapels to see rainbows and versions of God.” But another reader complained that they’d found it difficult to even read the poem, because the ebook wasn’t formatted properly. 50% Off on a Kindle Fire HDX 4G!